Register Log In Primarily Petroliana Shop Talk Forums Want to Buy Petroliana Looking for FUSE TINS, please. Last edited by hofilbert; Thu Aug 30 2018 08:03 PM. I buy H.O. slot cars! I also collect auto FUSE TINS - tell me what you have! 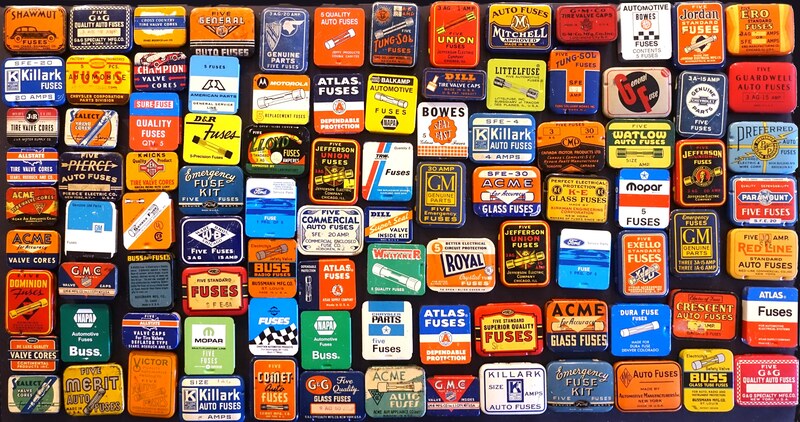 I've not seen much of any oil companies with fuses for sale really at all, except for P-66 like your tin. Was LION an oil company? They made a nice fuse tin. Mostly, they were fuse factories (many in STL, Chicago or NJ) that sold the merchandise in auto stores, OR, they were auto companies, like Chrysler, GM, Ford, etc. that marketed there own brand of fuses available to the public thru their dealerships. I am in need of a P-66 tin like you have if you ever want to let it go. Thanks for sharing. Please note, I've only been collecting these tins for just 4 months now. ITs TRUE! Was LION an oil company? They made a nice fuse tin. Nice collection Phil. I don't think the Lion fuse tin is from Lion Oil in AR. I've seen spark plugs, handy oil, tube patch , etc from an unrelated Lion company. I'll see if I can get you a photo/company info. No need for a photo. I know what it looks like (orange with dark lettering and a thick white "O" w/lion head inside). I missed out on an ebay auction for a nice mint one when I first started. Looking for another. Yes, the oil company had a few different logo images both with a large full bodied lion horizontal and LION set across the middle. I made some H.O. scale decal images years ago with the vintage and more 50's style logos. These are waterslide H.O. scale decals I made several years ago.